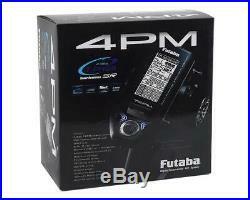 Futaba 4PM 2.4GHz 4-Channel T-FHSS Radio System with R304SB Receiver. T-FHSS SR (SUPER RESPONSE) AND TELEMETRY T-FHSS: In addition to the T-FHSS telemetry system, we added a T-FHSS SR (Super Response) system that increased processing speed to further improve response. SR system does not support telemetry function. R304SB and R304SB-E are not compatible with SR system. T-FHSS MINIZ SYSTEM: By changing to the MINIZ system in the receiver setting menu, you can use Kyosho Mini Z Evo dedicated receiver RA-42. TELEMETRY SYSTEM: The T4PM transmitter has adopted the newly developed bidirectional communication system T-FHSS. 2.4 GHZ SS RADIO COMMUNICATION SYSTEM: Frequency channel setting is unnecessary: Channel shifting takes place within the 2.4 GHz band automatically. This system minimizes the interference from other 2.4 GHz systems. MODEL MEMORY FOR 40 MODELS: Model names can use up to 10 letters, numbers, and symbols, so that logical names may be used. A model memory with different setups can be created by using the model copy function. 4 AXIS JOG BUTTON: The (JOG) button can be operated in 4 directions: up, down, left, and right. ESC-LINK FUNCTION (MC-LINK): This dedicated function allows you set up the Link software so that your T4PM can control variable frequency and other data changes in Futaba speed controllers (ESCs): MC950CR, MC850C, MC851C, MC602C, MC402CR, etc. BUS SERVO: This is a special function that allows setting of the parameters of our S. Bus servo whose settings are changed by using PC Link software. In addition to the conventional wired system, it can be set wirelessly in combination with the R334SBS or R334SBS-E. STEERING MIXING: Smooth cornering is possible by independent left and right steering servo setting. BRAKE MIXING FOR LARGE CARS (BRAKE): Brake mixing of the front and rear wheel of 1/5 gas power cars and other large cars can be adjusted independently. 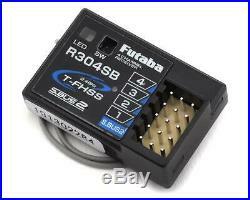 GYRO MIXING (GYRO MIX): The sensitivity of Futaba car rate gyros can be adjusted from the T4PM. 4WS MIXING FOR CRAWLERS AND OTHER 4WS TYPE (4WS): This function can be used with crawlers and other 4WS type vehicles. DUAL ESCS MIXING FOR CRAWLERS CARS (DUAL ESC): ESCs at the front and rear are controlled independently. CPS-1 MIXING (CPS MIX): LED lighting and flashing control using our CPS-1 channel power switch can be matched to steering and throttle operation by switch only. ANTI-SKID BRAKING SYSTEM TH A. S: This function applies the brakes so that the tires of gas powered cars, etc. Do not lose their grip on the road even when braking at corners. THROTTLE ACCELERATION (ACCEL): Gas power cars have a time lag before the clutch and brakes become effective. The throttle acceleration function reduces this time lag. THROTTLE SPEED (SPEED): Sudden trigger operation on a slippery road surface will only cause the tires to spin and the model to not accelerate smoothly. By setting the throttle speed function, operation can be performed smoothly and easily. It also suppresses battery consumption. STEERING SPEED (SPEED): When you sense that the steering servo is too fast, etc. The servo operating speed (direction that suppresses the maximum speed) can be adjusted. 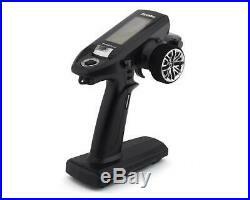 RACING TIMER (TIMER): The lap timer can record 100 lap times and total time. The timer can also be started automatically by trigger operation. The race time and audible alarm can be set. Re-/fueling time are indicated by an audible alarm. An up timer is also provided. FUNCTION SELECT SWITCH (SWITCH)/DIAL FUNCTION (TRIM DIAL): This assigns functions to 2 switches and dials (digital trim, digital dial). The step amount and operating direction can also be adjusted. Trim positioning at each model call is unnecessary because all the dials are digital. TRIGGER POSITION CAN BE CHANGED: The position of the throttle trigger can be moved forward and backward. TENSION ADJUSTMENT FUNCTION: The tension of the steering wheel and throttle trigger springs can be adjusted from the outside. MECHANICAL ATL ADJUSTMENT: Make this adjustment when you want to decrease the total travel of the brake (push) side of the throttle trigger. 100m (Except when using MINI Z system) (Optimum condition). X3 Dry Cell Battery Penlight (4.5 V). 150 mA or less. 35.1×23.2×8.5mm. DC 4.8V-7.4V. R304SB OR R334SBS Receiver. The item “FUT01004388-3 Futaba 4PM 4-Channel 2.4GHz T-FHSS Radio System withR304SB Receiver” is in sale since Monday, March 11, 2019. This item is in the category “Toys & Hobbies\Radio Control & Control Line\RC Model Vehicle Parts & Accs\Control, Radio & Electronics\Receivers & Transmitters”. The seller is “amain” and is located in Chico, California. This item can be shipped worldwide.